Zack, Mike, Jodie and Emily are Advanced Therapies Scientist apprentices. They are part of the first cohort of advanced therapies apprentices enrolled in September 2018. 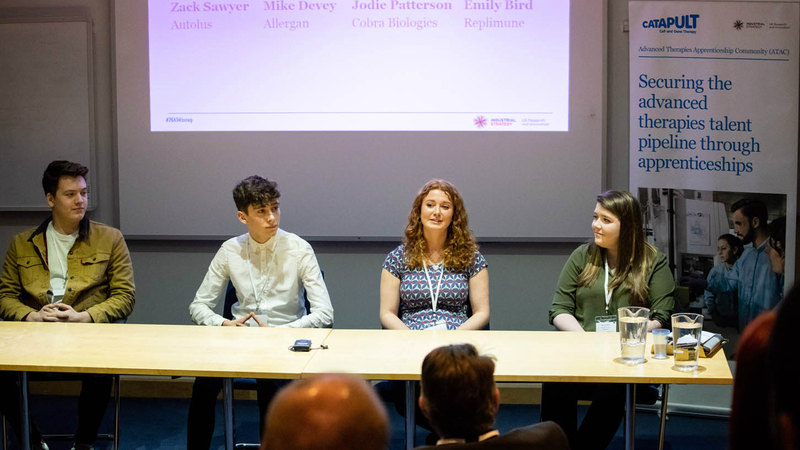 During National Apprenticeship Week 2019, they took part in a Q&A panel answering questions posed by the cell and gene therapy industry. For more highlights of the event watch this video. How important was the recruitment process in your experience? JODIE: One of the most important things about the recruitment process was all the information that I got from the company about the role, and from the University about what the apprenticeship was going to be like. During the assessment day I got to meet the scientists I’d be working with and I think all of that was good for giving me an idea of what it would be like and to make sure it was something that I wanted to do, as well as whether it was the role for me. What have been your biggest challenges and your biggest highlights over your first six months of your apprenticeship? MIKE: The biggest challenge for me was jumping straight out of A levels, and into a professional environment. It is a very daunting task to someone at 17. You’re used to speaking to people who are the same age as you and you get thrown into an environment where there are people of all different age groups and all different experience levels it’s very scary. The highlights for me was that I joined as part of a group of apprentices. So, having people who are at a similar level and age group to me was a very positive aspect of me starting my apprenticeship. JODIE: The biggest challenge for me was coming out of flexible education and going into essentially a nine to five. Instead of fitting my work around my life, suddenly I had to fit my life around my work which was more difficult than I anticipated. I think the highlight has been all the people I’ve got to meet, I never expected that that would be such a highlight but everyone around me is so supportive which I think you get when you are an apprentice, everyone wants to support you. What attracted you to the cell and gene therapy industry? MIKE: When I first joined my company, it was not involved in cell and gene therapy, it’s been something that I’ve got involved in the last two/three years. The second I heard that our site was getting involved in cell and gene therapy I was super excited because this is cutting edge science. This is hopefully research that’s going change a lot of people’s lives and even to be a tiny cog in a big machine is an incredible opportunity that I’m hopefully going to grasp with both hands. EMILY: It’s just so interesting. There’s a lot of stuff in the news now and that’s exciting. ZACK: I didn’t know a huge amount about cell and gene therapy until I’d seen the advertisement on the Government website, so I took it upon myself to ask my teachers at school about it and do a little bit of research by myself to find out more. What did you know about apprenticeships before you applied to your various organisations? MIKE: I found that the school I was in a lot of teachers would turn their nose up at the idea of apprenticeships especially apprenticeships in technical industries. Most people think apprenticeships are for builders and plumbers, they don’t realise that this kind of programme and method of training can work in this type of industry. What could have been done differently that would have made you think about doing an apprenticeship? JODIE: I think getting apprentices or people who have just come out of an apprenticeship to talk to students would make a massive difference. It’s OK when you’re at school and adults present to you but you don’t necessarily take much onboard. If you got people like us going into schools you might get a bit more engagement, you might build more of a personal rapport and make students see that an apprenticeship is an option. What advice would you give employers who were going to take on apprentices? ZACK: The structure around the apprentice is very important. If the people I work with hadn’t been so helpful, whenever I needed it, answering my questions, I wouldn’t have enjoyed my time nearly as much. EMILY: I think it’s been beneficial to me [working in a small organisation] because I get to see across different departments. My main role is analytical development, but I get involved across the facility, so I get to see behind the scenes of the company. Being in a smaller company, if I’m interested in something in say research, I can just go to someone in research and ask a few questions and they’re always willing to teach you. What have you taken from the cohort experience so far? JODIE: It’s nice to see the comparison between all the different organisations and even though we’re all on the same apprenticeship we’re all getting different things out of our experiences and I think that shows, it gives you an insight into different organisations other than your own.